We provide robust encoding and matching algorithms for all areas of fingerprint forensics, whether you require matching of just a few thousand records or into the millions our true multi-threading fingerprint matching engine can provide timely and accurate results. We support a large range of fingerprint sensors, ranging from single finger to multiple finger or palm scanners, and even flat bed scanners for importing ten print cards. 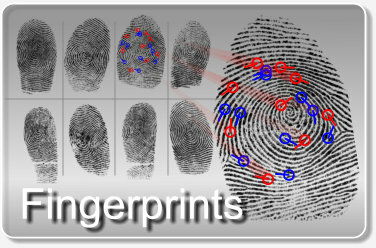 Fingerprints are analyzed for quality and classified before being segmented and biometric templates produced for later 1-1 or 1-many verification and identification purposes. When using RFID or bar-coded identity cards 1-1 verification of an individuals prints can be undertaken in just a fraction of a second, giving instant feedback to an operator of match no match. 1-Many identification is easy to achieve using our multi-threaded matching engine which can identify an individual fast and reliably. Biometric templates can be stored in file, memory or using secure connections to several databases including SQL and Oracle.